14/04/2018. 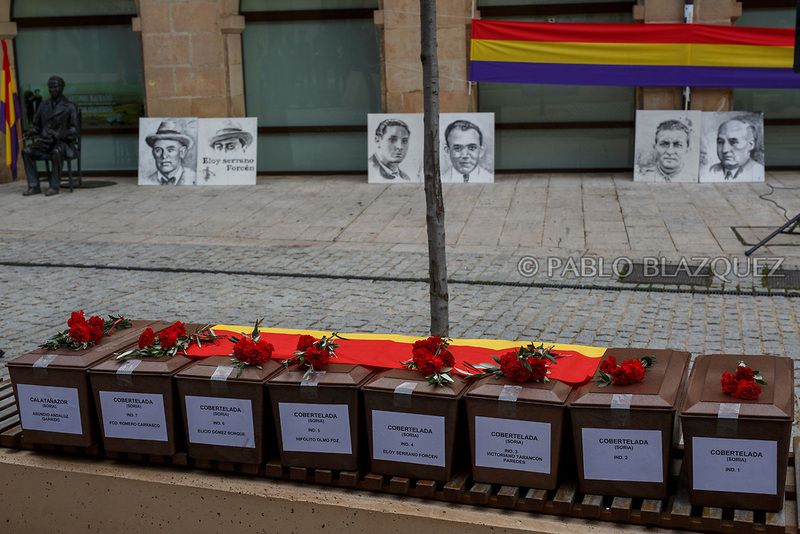 Coffins containing the bodies of victims of Spain Civil War exhumed in Cobertelada and Calatañazor are placed on a bench as portraits depicting Francisco Romero Carrasco (L), Eloy Serrano Forcen (2L), Elicio Gomez (3L), Hipolito Olmo Fernandez (3R), Victoriano Tarancon (2R) and Abundio Andaluz (R) lean against a wall during a homage to hand the remains to their relatives on April 14, 2018 in Soria, Spain. La Asociacion Soriana Recuerdo y Dignidad (ASRD) 'The Soria Association for Memory and Dignity' celebrated a tribute to hand over the remains of civil war victims to their families. The Society of Sciences of ARANZADI helped with the research, exhumation and identification of the bodies, after villagers passed the information about the mass grave, 81 years after the assassination took place, to the ASRD. Seven people were assassinated around August 25, 1936 by Falangists, as part of General Francisco Franco armed forces, and buried in the 'Fosa de los Maestros' (Teachers Mass Grave) near Cobertelada, Soria, after being taken from prison of Almazan during the Spanish Civil War. Five of them were teachers in the region, and also friends of Spanish writer Antonio Machado. The other two still remain unidentified. Another body was assassinated by Falangists accompanied by a priest in 1936, and was exhumed on 23 September of 2017 near Calatañazor, Soria. It belonged to Abundio Andaluz, a politician, lawyer and musician in Soria.